RFIT2000 is a fitting program written in Delphi. RFIT2000 fits X-ray and neutron reflectivity data. The search of global minima is done via successive descent from local minima. This method can be treated as a two stage loop repeated consequently. The first stage is the local minimization with the χ2 -like criterion and the second one is the descent from the most recent local minimum. It has been developed to run on PC's with a 32-bit Microsoft Windows operating system. Reflectivity curve is calculated with one of the methods: Kinematic, Parratt and Matrix. Matrix method works faster for films modeled with multiple repetion of one identcal structural units. Film structure is represented with the box model. Each box is characterized with the scattering density (Re and Im), thickness and roughness of the top interface. The software uses a version of the Downhill Simplex algorithm for the nonlinear least-squares fitting. Parameters can be refined, fixed or constrained. 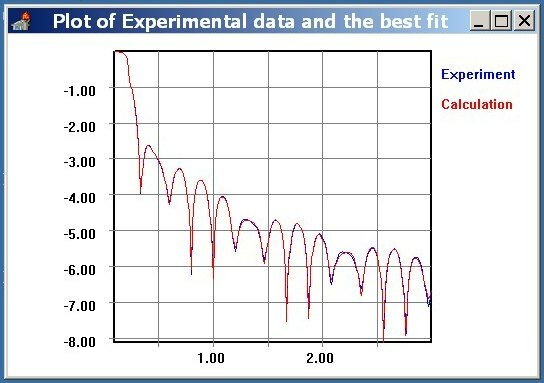 At each step of the refinement improvement the graphical display shows the experimental data and the fit. The χ2 value is updated in the information window. All the results (refined parameters, sigma values, calculated pattern…) are saved in specified files. Fitting procedure might be stope by typing Ctrl+Q in the main window. Oleg Konovalov, ESRF, 6 rue Jules Horowitz, BP220, 38043 GRENOBLE CEDEX, FRANCE (E-mail : konovalo@esrf.fr ).